I have been recently experimenting with a lot of different muscle rubs. I have been in search for the rub that will take the pain away the most without, hurting my nose. I also tend to try more products that are mess free. 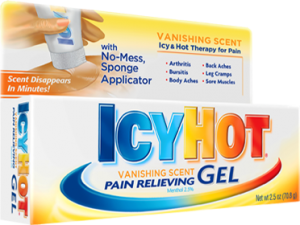 One rub that I have tried recently is the Icy Hot Vanishing Scent Pain Relieving Gel with No Mess Applicator. I have used these types of products before and like the no mess aspect, but thought that the vanishing scent aspect would ensure a perfect product. I purchased this tube for only about three dollars at my local Wal-Mart store. The tube was 2.5 ounces and had an easy to grip pop cap. This product only contains 2.5 percent menthol, which is why the scent is not as strong as other pain relieving creams or gels. The no mess applicator is a white sponge applicator with a hole in the middle where the icy hot gel squeezes out. trying to escape. The first two days when it did work, I would have to apply it every one or two hours to manage the pain. I don’t think that this is the medicine for me. I am sure it will work great for those suffering from mild pain, but I need much more than 2.5 percent menthol. It is something that is easy to travel with, and something that can be used when you are out and about. I think the price is practical, but don’t see myself purchasing this product again.